Crowdfunding campaigns often get a bad rap for vaporware and scams, even though the vast majority come through in the end. That bad rep comes from projects that get creative with the truth and the laws of thermodynamics, such as this slightly glorified USB meter. The premise of the PompAdatper starts with the truth: not all USB ports provide the same charging capacity, and some (like those on some computers) will change the amount of charge depending on what kind of device is plugged in. But that’s mostly where the truth ends, and the obfuscation sets in. 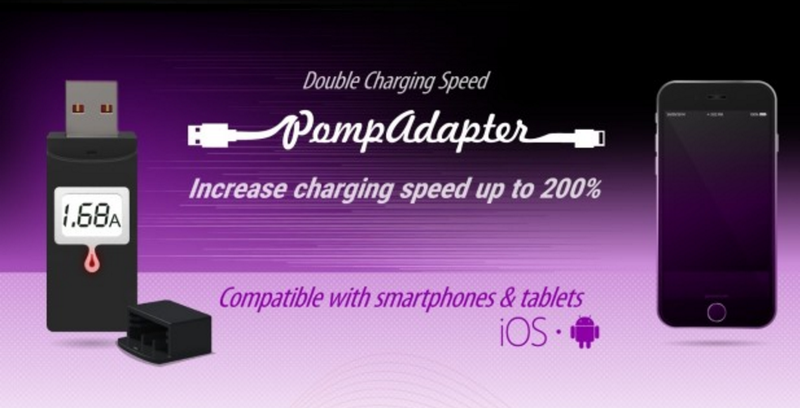 PompAdapter is a little USB device that sits between charger and cable, and claims to use a power controller to draw more current from the USB port, allowing the phone to charge twice as fast. There is a tiny grain of truth to this: the power ports on most PCs only provide 0.5A by default, whereas most phones and tablets ideally use 1-2A for charging. So, if you regularly charge a phone off a PC, you can ‘trick’ the USB ports to provide more power. You can do this by tiny software hacks, or, I suppose, you could pay $20 for a dumb USB dongle. But outside of this already-niche scenario, the PompAdapter will be at best useless, and at worst damaging to your phone. You see, phones already have built-in power controllers that regulate power draw in order to best charge your device. It’s the reason that you can leave your device plugged into the wall once the battery is full, and it won’t explode. That power controller is also integral to systems like Qualcomm’s quick charging, which regulates voltage in tiny increments to charge more efficiently. I worry that the power controller in the PompAdapter would mess up that system, ruining the efficiency, or your battery. To put it simply: smartphones are already as clever as can be when it comes to charging, and outside of one niche scenario outline above, your devices are best left alone to charge. By all means, spend money on a quality wall charger (they’re cheap!) that can provide the maximum current for your phone; just don’t fall for a glorified USB meter.